By using only the freshest ingredients and paying special attention to every detail, Catering Casa Millan has been able to become one of the top choices for wedding catering in Arlington, TX. This company not only provides some of the most delicious cuisine but the presentation of their food is incredible. Your guests are sure to be talking about these local caterers for years to come when you hire Catering Casa Millan for your wedding, social gathering, corporate lunch or party. You only need to view the Texas catering menu that Black-eyed Pea provides to find all of your favorites. They provide a great selection for every style of wedding. You will be able to select from a wide range of appetizers as well as pasta options, Mexican food, crawfish and seafood as well as desserts. There are bonus options such as a carving station or a martini bar that will make your wedding even more of a celebration. While this quality does not come cheap, this service aims to always be affordable. 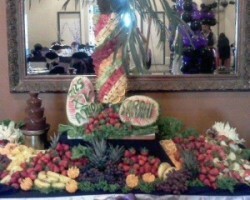 To opt for something extra special and unique on your wedding day you should certainly turn to Rudy’s. Unlike many other wedding catering companies in Arlington, which will try to offer everything from Mexican food to Italian catering, Rudy’s specializes only in the best BBQ in the state. They have a great selection for you to choose from and you will be able to have a buffet style meal with lots of great extras added. The food will be mouthwatering and the service will be the friendliest in the city, what could be better? 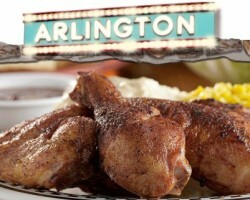 For a simpler approach to wedding cuisine you need to turn to the Arlington catering service supplied by Super Chix. 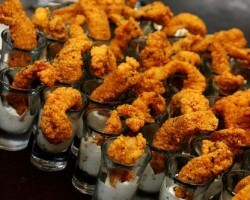 This company specializes in catering succulent chicken tenders and chicken sandwiches. You will be able to add hand-cut fries and a range of sauces. 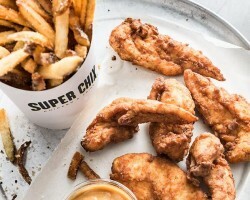 While Super Chix has opted for simplicity they have certainly not sacrificed on gourmet ingredients and a delicious catering option. Their catering option also includes an expert to help setup, serve and generally assist with making your wedding meal extra special. For the perfect chicken BBQ menu there is no better caterer to opt for than Babe’s Chicken Dinner House. Everything that they create is from scratch and will taste absolutely delicious. This is due to their family secret recipe that has is loved across Texas. This company doesn’t have a set catering menu as they want to help every couple that comes to them to craft their own ideal wedding meal. 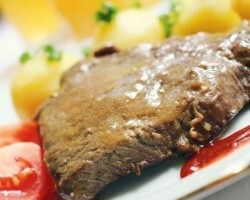 Not only is the food always the best but the prices are highly affordable too.